I had a plan for Friday sewing this week, but then I got the call that my SERGER was READY to be picked up from the repair shop. I was so excited that I put Bean in the car and we left that minute, hehe. This is a serger that a very generous friend of my mother gave her to give to me. When I first received it I could tell it was a GIANT step up from the serger I had purchased off ebay about ten years prior. This one was all metal and it even smelled industrial, hehe. I plugged it in and it whizzed through a few new cloth wipes for Bean in no time (that’s what I make with my husbands ratty old t-shirts just by serging a couple of layers together into rectangles). I was in love with the feel of this new-to-me serger. But then I was making some sweatshirts and I pulled too much going around a curve and I caused a jam. One of the needles broke and somehow I had knocked out the timing. I don’t think I’ve been that sad about sewing for a long time. I had a pile of stuff I was planning to plow through with the ease of the serger and now it was obvious I’d have to drop it off for service. Now if this had been my previous serger, I would have just opened it up and tried to fix the timing on my own. I even looked up a few articles online with tips. For some reason I just didn’t feel right about that with the new machine. I had received it at no cost so a trip to the shop for a REAL repair and tune up seemed the right thing to do. So I dropped it off at my LQS not having any idea when it would be returned. Then I waited. When I got it back I couldn’t wait to try out a quick project and see how it was running. I am currently taking an online Whipstitch course that I won through a Project Run & Play giveaway. (FYI PR&P All Stars begins on Monday!!) Now I have never really taken any formal instruction for garment sewing. Or any sewing for that matter, hehe. When I won the giveaway I wasn’t sure what to think, but I am so happy that I decided to start Deborah’s Sewing Clothes for Kids class. So far I have previously sewn the types of garments we are making, but I’m always open to an expert’s tip and tricks and she has a few great ones up her sleeve. When you’re mostly self taught you begin to realize there are a lot of little things that you could do to simplify the process. Plus she gives you a bunch of patterns for some cute kids clothes so it’s a great jumping off point for making new things. Oh, AND there’s boy stuff which I know so little about so that’s been a neat opportunity. But I digress…..back to this amazing serger (yes that’s the same awesome/only shot I have of the serger – really taken so I’d remember the tension settings). 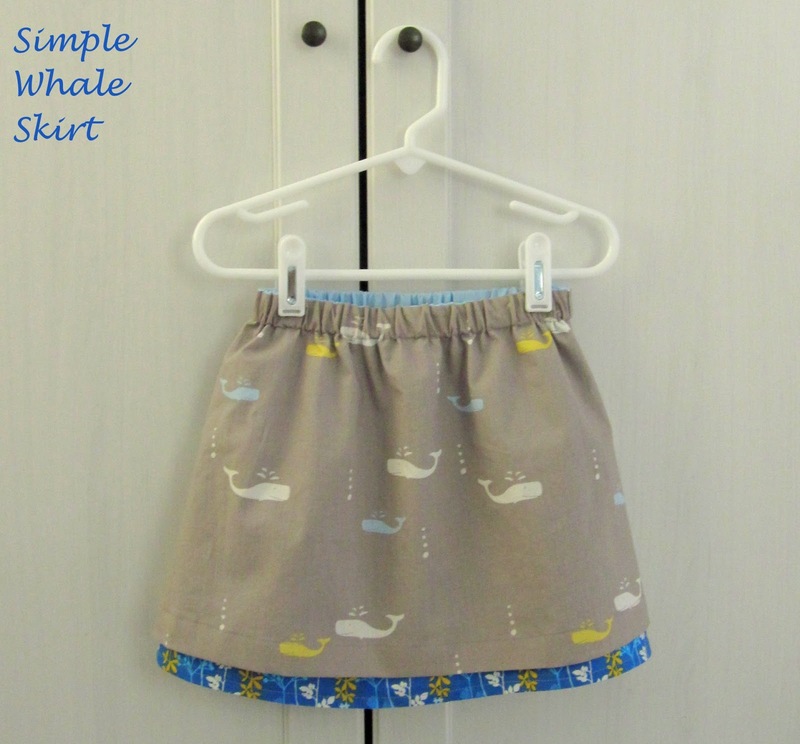 The first thing Deborah had us make was a simple skirt. I’m not a huge fan of skirts on babies. They are cute, but a little impractical because they ride up or down and I’d just rather a full dress or a skirt/bloomer combo. 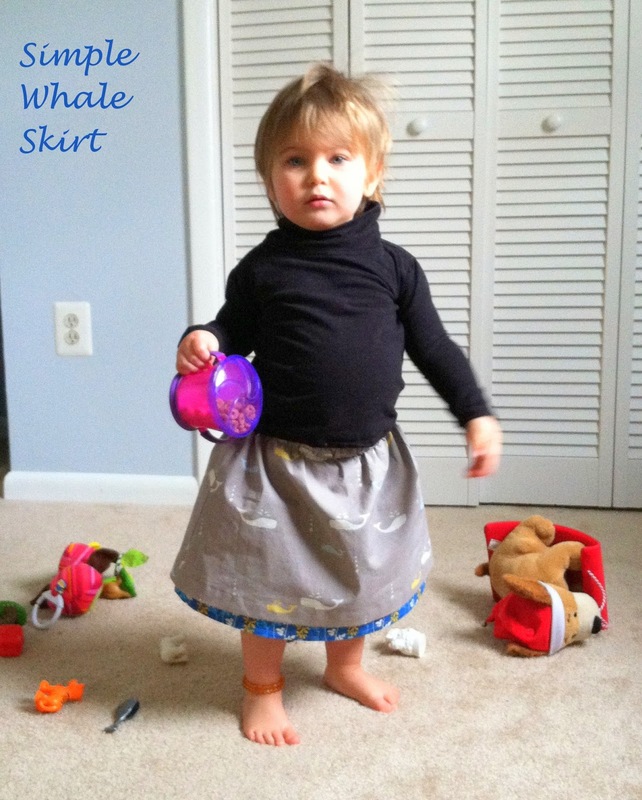 However, Bean is quickly falling into the cute little girl stage where skirts become a go to item. I’m very excited about the possibilities. 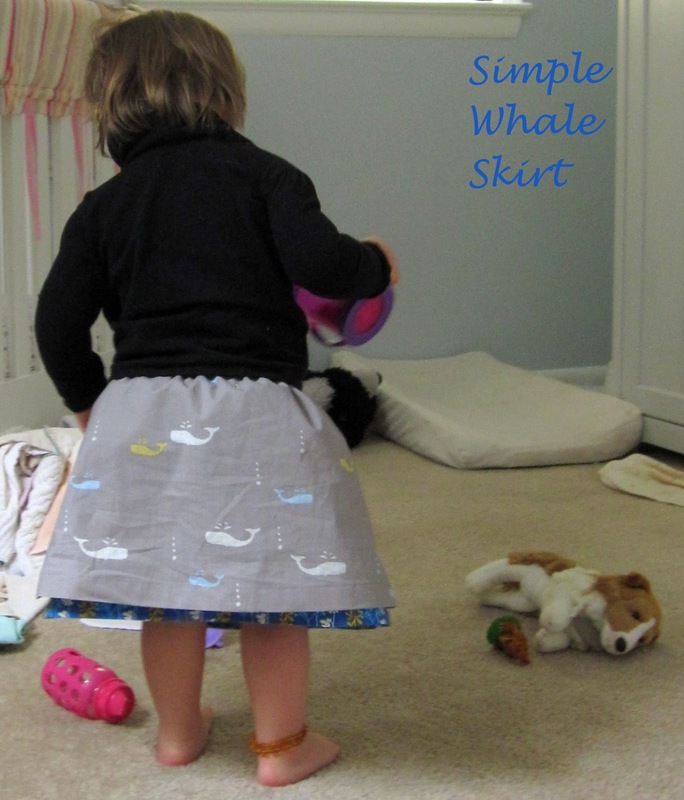 The simple skirt pattern we received was meant to be a starting point to take your skirt anywhere you’d like. Of course a fat quarter wasn’t enough for a whole skirt layer so I used some light blue solid at the top of the layer until there was enough seaweed fabric to cover what was left of the bottom of the skirt layer. Sorry for the iPhone pictures. Bean would not sit still once the skirt was on – what with all the twirling possibilities – so every single picture was blurry, hehe. This skirt took me a half hour. Seriously. That is crazy fast for me since I am obsessed with pulling every thread to the back and top stitching seams and blah blah blah. But the serger did it’s thing and even with sewing the extra seam where the blue and seaweed fabric had to meet at the underskirt it was super fast. 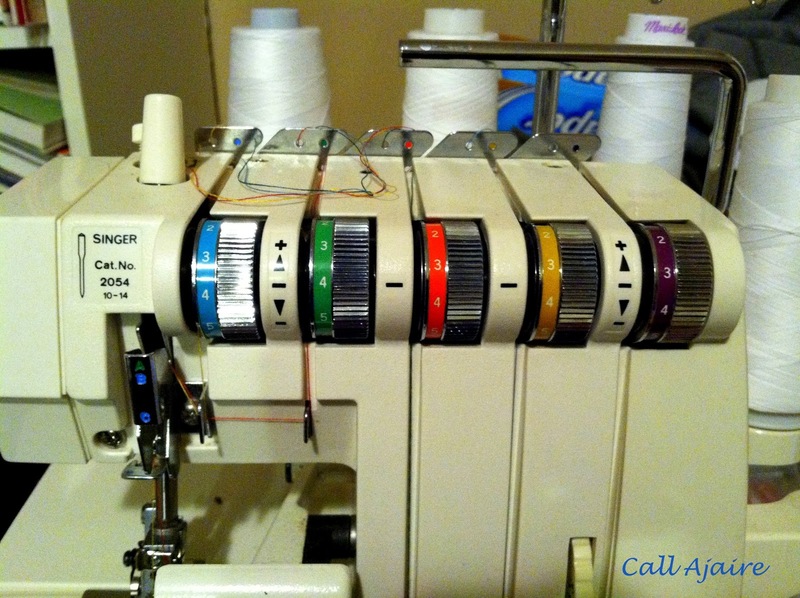 I am once again in love with this serger and cannot wait for all the projects to come! 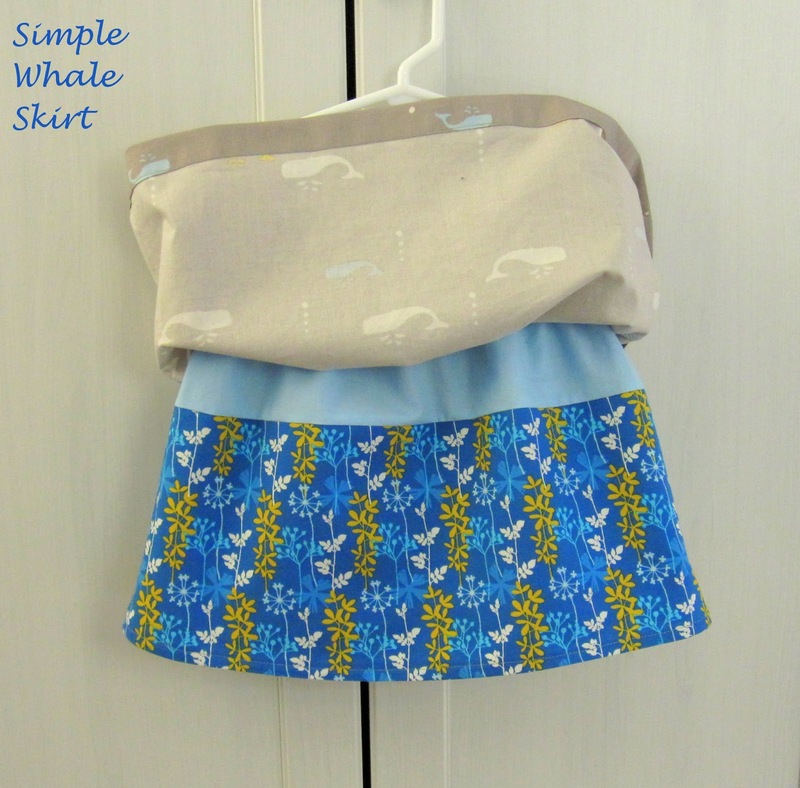 You're just rubbing in the missing hippos skirt with all of this whales fabric. And as far as metal for a sewing machine- I will never replace my Bernina sewing machine because of the metal construction. It just feels so much more professional and serious than any plastic one I've ever used. I see so many new machines now, that are supposed to be high quality that are all plastic and they just look like toys. I didn't realize until now that my serger might have a lot of plastic and might be part of why I am not madly in love with it. Or it could be because I've just winged it and not really had serious lessons on the magic of what sergers can do. Plus, threading it takes more time than actually sewing a project, so it's a real PIA. I see seaweed, too! I love how little girls twirl as soon as they get a skirt on, so sweet. This is absolutely beautiful! I love it so much! Glad you managed to get your serger back to make it! Have a great Easter! Love this!! Super cute and super cute baby! I like the lining. Found you over at Sew much Ado.. I'm a fellow sewer. That skirt is adorable..Thank you for sharing with the Clever Chicks Blog Hop this week; I hope you’ll join us again!